Shawarma–thinly sliced spiced lamb or poultry roasted on a vertical spit–is an icon of Middle Eastern street food. So how do you cook it on a conventional grill? Here’s how we did it recently on the set of Le Maitre du Grill. The recipe’s in Planet Barbecue on page 409. You start by directly grilling thin slices of spice-rubbed turkey over charcoal. 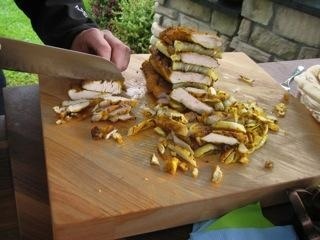 Stack the turkey slices in a pile and thinly slice across the grain. This simulates the way shawarma is sliced directly off the rotisserie in the Middle East. 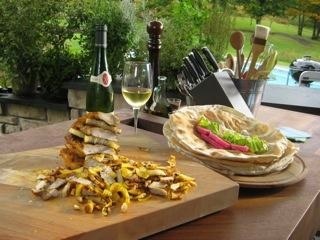 Serve the shawarma on toasted pita bread with Middle East pickles and tahini sauce.